With the approaching Anand – Topalov World Chess Championship match, the media in Bulgaria is becoming more and more active. The top notch information last week came from an interview with Silvio Danailov by Antoni Jordanov for Trud (the second largest daily in the country with 500 000 readers). Danailov speaks about politics, Magnus Carlsen, the coming World Chess Championship, Vishy Anand and his secret seconds, the preparation of Veselin Topalov at Canary Islands, and confirms what has been rummored for a while – Mtel Masters 2010 will take a break and will not happen this year. 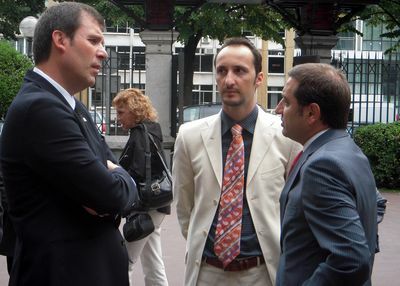 Mr. Danailov, why do you want to become the president of European chess? The ECU is respectable institution and has potential, because it has 54 member states. People from other countires initiated talks with me, these people want ECU to be headed by someone with professionalism and new ideas. Up until now I have been more of a businessman in chess, now there is a need to do politics. Are the elections predominantly based on politics or is it a question of ideas? I have no experience in politics, but others convinced me that I can do it and with the right strategy can achieve good results. The people in chess know very well what each candidate can bring. The elections will be based on a mixture of politics and vision. It is believed that my opponent will be Ali Nihat Yazici from Turkey, who has his own lobby. The fight will be challenging. In my carreer I have practically accomplished everything I have dreamed of. Or even more. No one believed that a Bulgarian man can become world champion – Vesko Topalov and I made it happen. I organized the supertournament “M-tel masters” in Sofia and introduced the Sofia rules worldwide; along with some friends we created the “Grand Slam” in Chess. In this way my professional career reached its ceiling. I did not give thought to this move, but the challenge is big. Also, people convinced me that I am the right figure. So, I am entering politics. Chess politics. No, no, while Kirsan Ilyumzhinov is the leader of FIDE, it would not cross my mind. After that, I do not know. In chess we are accustomed to play move by move and not to rush things. Because rushed action lead to wrong decisions. So, let these elections pass first. If I succeed, it will be prestigious for Bulgaria as well. It is very intriguing. Now everyone awaits with interest who is the Russian Federation going to support because this will, to a large extent, determine the favorite to win. But no matter what happens, every one of them has his advantages. Ilymzhinov is already 15 years excelent President, doing a lot of things for chess, but Karpov is an extremely dangerous opponent as a politician – very intelligent and swift. They are both wealthy. Is money going to play? In elections money always comes into play. My advantages are a professional career, the results, and the ideas. 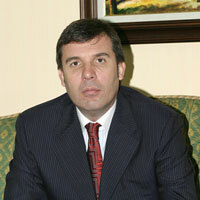 The candidate from Turkey has experience in politics, after all he is vice President of FIDE. I do not know whether he is wealthy, but I am aware that he has strong back up from Turkey. Because this is part of the government strategy of European community integration for the future. Lets talk about the Topalov – Anand Match. What is new from Spain – both Topalov and you are there? Vesko is preparing at the Canary Islands, his preparation is going according to schedule and there is nothing out of the ordinary. Aren’t you concerned by the form of his second Ivan Cheparinov, who performed poorly on the EICC? Of course I am concerned, It would have been much better for him to have finished with better results and to be more motivated. Then the sentiment would have been better. Nevertheless, I hope that Ivan is a professional and since he has always had great ideas, now will be the same. Let us not forget that Vesko has also undergone such dark periods. It happens to every sports person and one should not fall into despair. And what about the shape of Vesko, do you have any concerns? Naturally, I am concerned, but we are doing everything we can to reach our goal. The rest is destiny. How are you going to comment on the performance of the Bulgarians on the EICC, where among the men all our representatives are ranked below 70th place? Chess is not much more different from the rest of the sports, and as everywhere else there are declines in chess as well. I expected much more from Cheparinov, for the rest I am not surprised. However, I am pleased by Kiprian Barbatov – he has a lot to learn, but is on the right track. We, the federation, and me personally, are doing whatever we can. Maybe we will include him in the team for the Chess Olympiad in Khanty Mansiysk. Is the gap between Topalov and the rest [of the Bulgarian players] becoming too large? Topalov is a phenomenon, it is very hard to compare the others to him. The same is the case in India with Anand and the rest of the chess players. What does the intelligence on Anand bring – can he surprise Vesko and you? There can always be surprise – chess is developing with a fast pace, computers help, newer and newer versions are created. He might surprise us with the choice of seconds. For now they are clear. We know that he is in the midst of hard preparation, nothing else. With him, everything is a deep secret. He has made no public announcement and has not shown on public places, only at the Bundesliga and Corus in January. However, at both places he was obviously saving himself and did not show anything special. Anand will have less psychological pressure in Sofia. And it is natural that everyone in Bulgaria expects Vesko to win. How are you going to evaluate another duo – Magnus Carlsen and Gary Kasparov, with which you might clash someday? They have accomplished outstanding results, but have recently split for some reason – I am not aware which, but it is good for us. I am content from professional point of view because this duo was a killer one. Carlsen is dangerous to everyone, but it is one thing to have Carlsen with Kasparov and another thing to have Carlsen without him. It is already clear that there is not going to be a supertournament Mtel Masters? We discussed extensively the idea with the sponsor, since the deadlines did not allow us to organize two big tournaments for such a short period of time – the match with Anand and Mtel Masters. One of the explanations was that the match with Anand will generate great interest and the tournament will fade away. I did not share this opinion and believe that it is quite the contrary – the popularity of chess after the match would have been greater and the tournament could only benefit from it. Nevertheless, the sponsor decided and they chose not to have Mtel Masters this year, they will only sponsor Topalov personally during the match. Isn’t this going to eventually have a repercussion on the reputation of the tournament for the coming year? It will have a repercussion, but in history there have been such cases with other tournaments – both with Corus and Linares. But also you are falling in a uncomfortable situation as ideologist and creator of the Grand Slam, part of which is Mtel Masters. Yes, it is not pleasant. But, regretfully, now there is nothing more to be done. There is a temporary crisis, the same in the rest of the world. Chess, after all, is not such an expensive sport and I hope that next year there will be no longer problems.